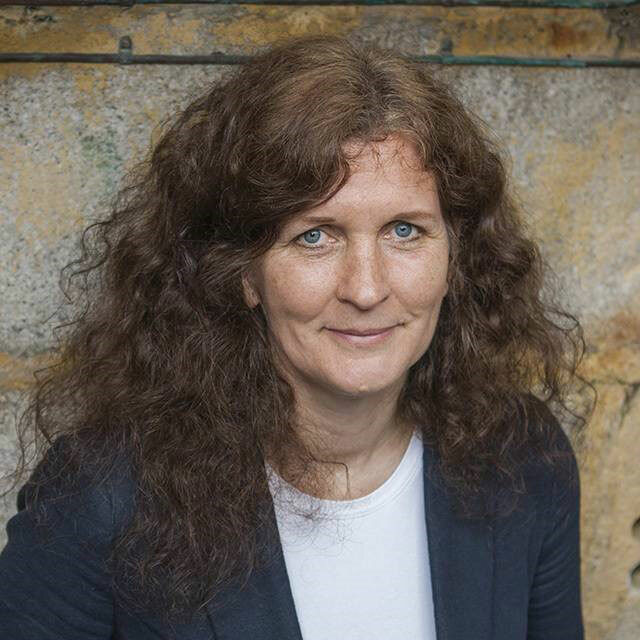 This blog post was written by Prof Alison Raby for the EPSRC. Picture yourself in a 150-year-old lighthouse on a rock outcrop miles from dry land during a force nine gale. You’re sitting in a small kitchen 30 metres above cauldron-like waves that occasionally rear up and smash against the tower, causing the crockery in the cupboards to rattle. Welcome to the world of a 21st-century Lighthouse Engineer! You won’t be on station to keep the lights on, as the lighthouses have all become automated in recent decades. Instead, as maintenance crew, you’ll be staying for up to two weeks to look after anything from the central heating that keeps damp from the structure, to the sophisticated communication systems operating around the clock to keep mariners safe. Trinity House, a charity and statutory General Lighthouse Authority dedicated to protecting shipping and seafarers, approached us at the University of Plymouth in 2011 to join in research on these rock lighthouses. 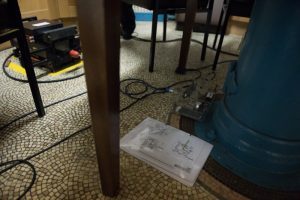 Trinity House was getting disturbing accounts from engineers on station during storms, and were concerned that the situation might only worsen with climate change. The famous Eddystone Lighthouse was the focus of the pilot project, being the closest lighthouse to the university campus. Line-of-site views of the tower meant that we could establish control of our video cameras, linking the incoming waves with the tower vibration recordings. The team were probably in a minority of people in the south-west of the UK longing for more storms in the winter of 2013/14, with a particular requirement that the storms arrived at high tide and in daylight. This combination of factors meant that the waves were as big as they could be before breaking, and we could film them in all their glory. Storms Petra and Hercules did not disappoint and we ended the season with about 3,000 impact events to analyse and some preliminary structural modelling. Fast forward to 2016 and EPSRC funded a comprehensive study on lighthouses. We teamed up with the University of Exeter for field-testing and UCL for structural modelling. At Plymouth we kept our focus on the hydrodynamics, using extreme wave analysis, the COAST Laboratory, and Computational Fluid Dynamics (CFD). The two other UK General Lighthouse Authorities (Northern Lighthouse Board and Irish Lights) joined Trinity House, which enabled us to consider the geographically diverse lighthouses of Les Hanois, Wolf Rock, Longships, Bishop Rock, Fastnet, Dubh Artach and back to Eddystone. Constrained only by aviation rules, the team flew by helicopter in all conditions to conduct vibration tests of these lighthouses. This was not for the faint-hearted: heavy equipment had to be hauled up and down steep spiral staircases (or in some towers only ladders). The work occasionally meant staying overnight, and on one occasion being stranded for the best part of a week when the fog rolled in at Fastnet. Trouble-shooting equipment problems so remote from the lab poses particular challenges and requires a resourceful character. On two of the lighthouses (Wolf Rock and Fastnet), monitoring equipment has been installed to capture the structural response to extreme storm loads. The structural modelling has moved apace, with vibration data validating the finite and discrete element models. Extreme wave analysis has provided the characteristic load for the models and is revealing some helpful findings about the best approach to represent the real structure behaviour. Interestingly, a quick tool for structural assessment has been devised which can be applied on all these towers to show how the size and extent of the wave loading affects the stability of the structure. By combining the measurements with the modelling, we also found how the modern helideck structures affect lighthouse vibration characteristics. In the lab we’re untangling the wave front slamming force, from the more slowly varying component which follows. We’ll combine understanding from these tests with CFD findings to give a fuller picture of wave loading on lighthouses, which may be applicable to other offshore structures like the giant wind turbines currently being deployed in relatively shallow water. It’s a real privilege to be involved in the latest chapter of these iconic structures, and we hope that insight gained through the project keeps the lighthouse engineers, and the mariners, safe for generations to come. Lighthouses are essential for the safety of mariners in navigating at sea but are they fit for purpose? This film looks at the undergoing research of STORMLAMP project into the impact of strong waves on lighthouse and how the structure changes. 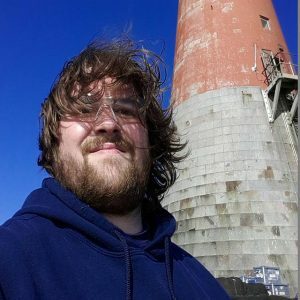 You can enjoy some breath-taking drone aerial views and videos of the on-site work on rock mounted lighthouses, in peaceful or not so peaceful weather. Alongside with these shots, the film presents the core aspects of the STORMLAMP project and explains how the expertise of University of Plymouth, University of Exeter and University College London is combined for protecting our lighthouses and the safety of mariners. Congratulations to Alessandro Antonini, indispensable member of STORMLAMP project for his promotion to Lecturer. Alessandro joined Plymouth University in 2016 for working in STORMLAMP as Research Fellow. His work on analytic estimation of wave impacts, hydrodynamic lab-testing, on-site testing and data treatment has been of significant importance. He will keep contributing to the project from the position of Lecturer in Mechanical Engineering of Plymouth University. 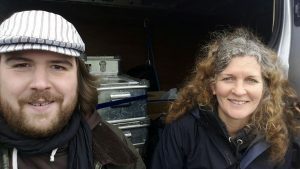 Dr Alison Raby and Dr Alessandro Antonini this weekend drove model test equipment up to Oban, Scotland in advance of tests on Dubh Artach lighthouse. Van packed and ready to go. 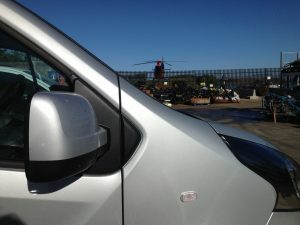 From van to helicopter, the transport gets ever more impressive. 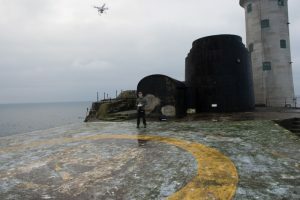 On Monday 5th December a team of researchers for the EPSRC STORMLAMP were flown from Castletown-Bearhaven, Ireland to Fastnet Rock, 6 miles off the Irish mainland. James Bassitt, Karen Faulkner and Ian Moon from University of Exeter, along with Alessandro Antonini from Plymouth University and Athanasios Pappas from UCL planned to stay overnight after carry out a modal test of the lighthouse, while James Bassitt installed a remote acceleration monitoring system. Following a series of modal tests on lighthouses at Les Hanois (Guernsey), Wolf Rock (Cornwall), Longships (Cornwall) and Bishop Rock (Scilly Isles), James, Ian and Alessandro had developed skills in modal testing using an array of accelerometers and an electrodynamic shaker. 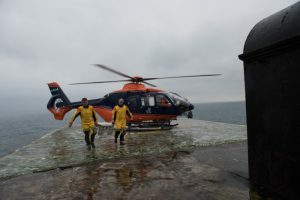 While these lighthouses are accessed via a helideck constructed above the lantern, Fastnet is accessed by a helipad on a utility building constructed on the cramped space of the rock with stone steps up to the lighthouse. 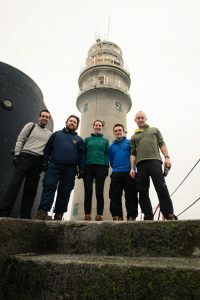 A team of five was used at Fastnet to manage the equipment transfer to and from the upper level of the lighthouse and to allow James Bassitt to install and commission the monitoring system. First measurements started at 2PM on Monday and continued until 9.30PM, with the APS shaker providing a narrow-band swept sine signal to excite structural modes that are typically in the range 4-6 Hz for this type of structure. 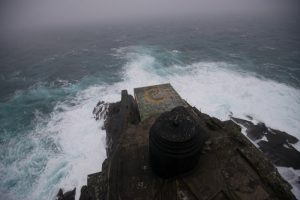 The accelerometer array was left recording data overnight as storm winds and occasionally waves battered the lighthouse. 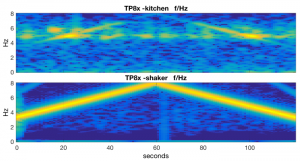 Shaker and bi-axial accelerometer pair in lighthouse kitchen. Lighthouse acceleration and shaker force data used for modal identification. While on site James Bassitt deployed a drone for aerial footage at medium and close range. Weather conditions of wind and sea spray overcame the drone after 11 minutes of flying the machine was returned to base with full manual control after which it was unserviceable. The short flight provided spectacular views of the rock and lighthouse. Fastnet Rock is notorious for bad weather, particularly fog, hence its existence. 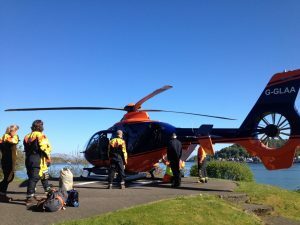 From Tuesday 6th until Friday 9th fog was severe enough to prevent helicopter landing, stranding the team. 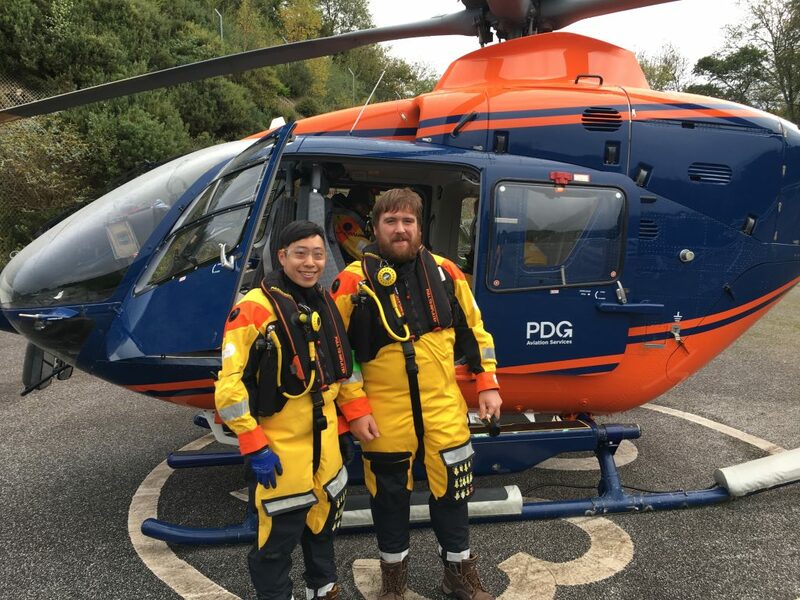 While having more than the mandatory supply of emergency rations the team were very happy when a break in the fog allowed the pilot to make two trips to pick up crew and equipment. The Exeter team, who travel with the equipment by van and ferry arrived in Exeter late on Saturday 10th. Without a retrofitted helideck, Fastnet Lighthouse is a relatively ‘clean’ structure for which to create a mathematical model. Using the experimental modal test data and masonry stiffness estimates obtained on site using a Schmidt Hammer UCL researchers on the STORMLAMP project will be able to create a high-fidelity model which is intended to be used to estimate wave loads using response data provided by the monitoring system. Two more lighthouse modal tests are lined up for 2017; one is likely to be Dubh Artach off the Scottish West coast and Eddystone Lighthouse off Plymouth.